I have been very lucky to always have such wonderful friends. When I joined the West Michigan Quilters Guild (WMQG) I was a bit overwhelmed with so many people and everyone seemed to know everyone but me! There were a few people I knew from different quilt shops but it wasn't until I "jumped in" and volunteered to be the Librarian of the guild that I found some wonderful people. For the most part we had one thing in common, Quilting. I could go on and on about how they have all touched my life in various ways, cue the violin, dim the lights, you know the drill. A couple weeks ago a group of us quilters got together for a stitch-in. This is were a bunch of quilters congregate and work on their various projects, chit chat and most importantly eat! This turned out for me to be a most memorable day because three of my wonderful friends presented me with these fabulous pin cushions! 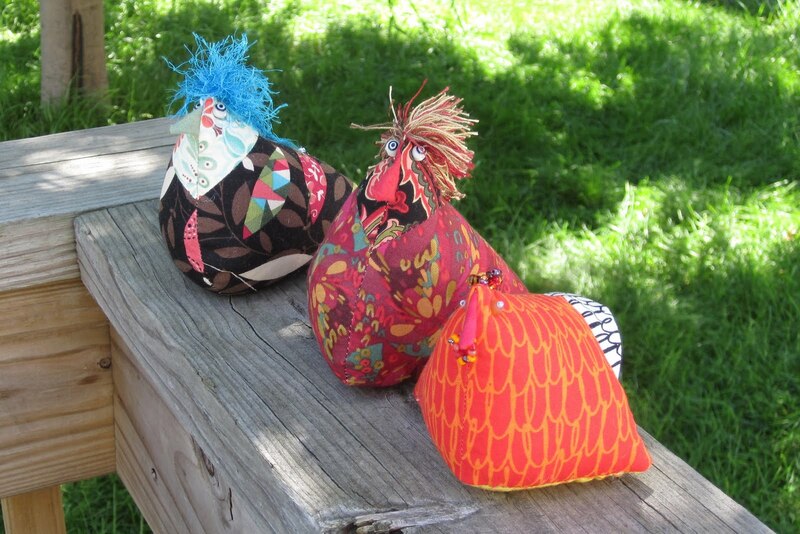 Sue and Terri got me the chickens when they were at a quilt show and Betsy made the rooster for me to go along. Of course they know how much I want to have chickens but live in the city awaiting the day when I can move to the country etc. So now I can start my chicken coop in my sewing studio! Hey! I recognize those! Couldn't help thinking of you when we found those at the show.